← Red Dragon Roll anyone?! Okay…. Rainy days need a push back and what’s better than comfort food?! 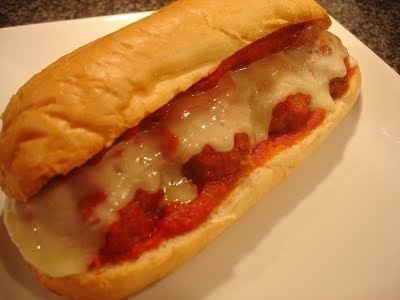 Homemade meatball sub was the cure last night! Homemade meatballs cooked in the sauce is the only way to go. 1 large and 1 small can of tomato sauce or your favorite Italian crushed tomatoes. In a large bowl add in both ground beef and pork, add salt, pepper, Italian seasoning, garlic and diced onion and mix. Add in egg, parm and bread crumbs and mix together all ingredients. Form into the size meatball that you desire and place aside. Warm up a large pot with olive oil. Place carefully each meatball in and carefully brown all sides. Once all the meatballs are browed add in the tomatoes /tomato sauce and carefully mix. Simmer for approx 1 hour and 15 minutes until all the flavors have melded and the sauce ha thickened. Pick your favorite bread, an Italian blend of provolone, mozzarella and parmigiana cheese and build your master piece. You can melt your cheese and heat your bread by quickly broiling or a few minutes to melt the cheese and crisp the read in a 350 degree oven. You know what you like… Take the basic perfect recipe and kick it your way…. This was the perfect dish last night to warm up the kids from a rainy soccer night. Posted on April 26, 2012, in Food glorious food from the heart and soul and tagged Warms the tummy and the heart. Bookmark the permalink. 20 Comments. YUM..! Aaahh to have real cheese again.. siiighhh.. Gotta try this with rice cheese and turkey meatballs! Cheers. Just followed your blog too! Looks great. Thank you. Nade, where are you located? Do you live in Italy? may as well check things out. I like what I see so now i’m following you. Look forward to checking out your web page for a second time. Thank you for the Kim feedback ! I would love more visits for sure! Let me know if there is anything I can find out for you or review ! Have a great day! Thank you for your constructive feedback. I should spend some time to look into improving the layout. some common things, The site taste is wonderful, the articles is truly excellent : D.